Hi. Like any normal person, I want to set up an automation which utilizes page tracking. I use Leadpages for my funnel. 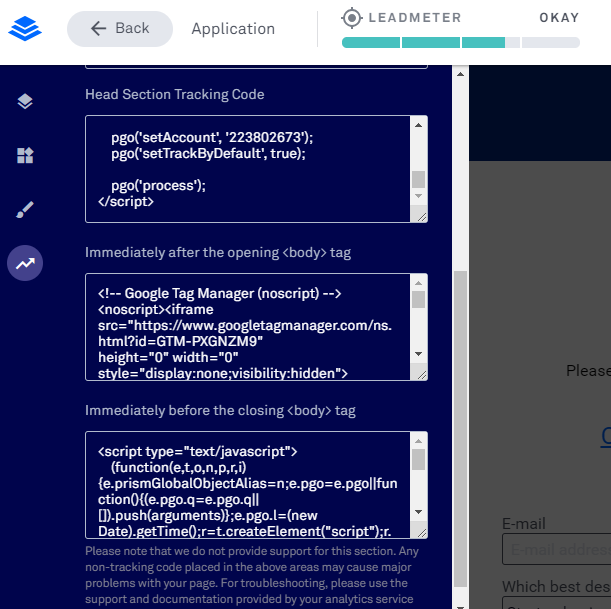 ActiveCampaign instructs you to place their tracking code in the page “footer”, however no such area is available within LeadPages. However, I spoke with LeadPages support, and they told me that I could place it within the body area. Anyways, for good measure, I placed the tracking code in every section that I could (see screenshot). Still, it doesn’t work. I literally cannot find any way to track when people are on my page. And, there is no other way that I can make this automation work - I NEED to track when people visit a particular page, it’s the only option. Leadpages works with other CRM integrations, and site tracking code works within the body tag without an issue for other CRMs. Not AC, apparently. I’ve seen other people have similar problems, only to have AC staff recommend not using page tracking because they don’t support an integration with a particular (major) landing page provider. Wow, seriously? This is 1 of 3 problems I’m currently having with Active Campaign. To be honest, I’m really unhappy with the incompetent level of support, and that I have to resort to posting in the forum to get this taken care of. I’ll be seeking a refund soon if I can’t get these issue(s) resolved. By the looks of it you have Google Tag Manager (GTM) installed, why not simply fire the tracking code from there? That’s what it’s for.